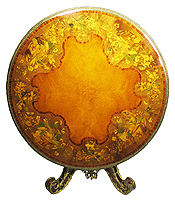 An Extraordinary Fine English Marquetry Sycamore, Amboyna, Burr-Walnut and Ormolu Mounted Circular Tulipwood Crossbanding Centre Table with Inlaid Decorations Depicting Wicker Baskets Full of Flowers, Vines, Butterflies and Hummingbirds, in the Manner and attributed to Edward Holmes Baldock (1777-1845) after a design by Richard Bridgens. Circa: London, 1830-1840. Edward Holmes Baldock (1777-1845) is listed in London Trade Directories of the period in various capacities. He first appears listed at 7 Hanway Street, London in 1805 described as a '...dealer in china and glass' and by 1821 as '...an antique furniture and ornamental furniture dealer'. By 1826 the various facets of the business included '...buying and selling, exchanging and valuing china, cabinets, screens, bronzes etc' Baldock's business seems to have largely involved trading in foreign items and from 1832-1837 he was the purveyor of earthenware and glass to William IV and later purveyor of china to Queen Victoria from 1838 until his death. 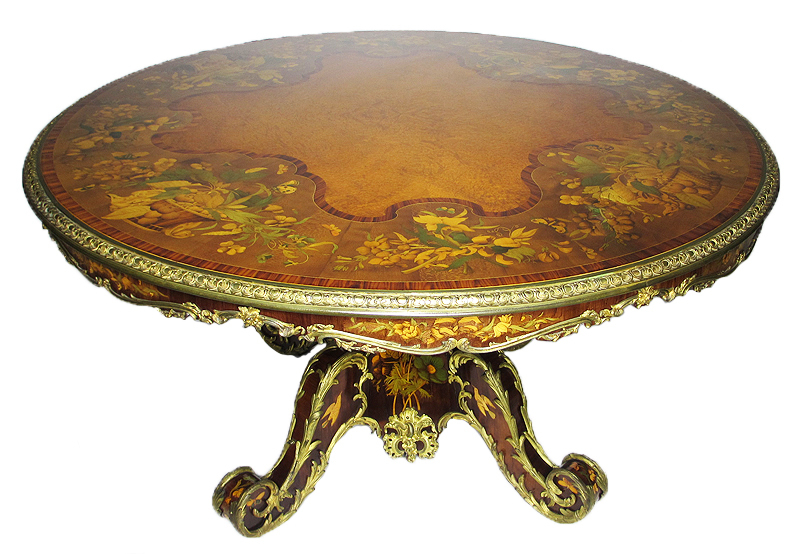 He is known to have repaired, re-modelled and adapted furniture, often 18th century pieces, but he also designed furniture both in the 18th century style and in more contemporary styles. The pieces that appear with the E.H.B cypher may have been made by him at his Hanway Street workshop but there is no documentary proof as to whether he both designed and manufactured them. 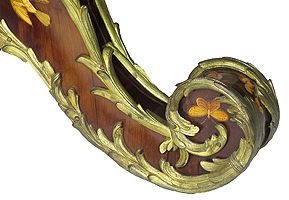 Rather than being a straightforward manufacturer Baldock's activities link him more closely with the 18th century marchands-merciers such as Daguerre and Poirier. 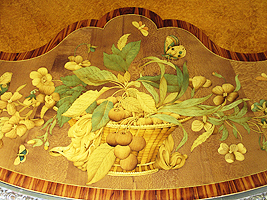 It is likely that there is a strong connection between the manufacture of Baldock's marquetry pieces and the Blake family of inlayers. 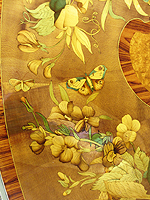 The fashion for this type of inlay was popularised by the Tottenham Court Road inlayer and buhl manufacturer Robert Blake in the 1820s. By the 1840s the firm were trading as Blake, Geo. & Brothers, inlayers, etc' in Tottenam Court Road and Mount Street, Mayfair and were renamed George Blake & Co. sometime in the late 1840's, see C. Gilbert, Pictorial Dictionary of Marked London Furniture 1700-1840, Leeds, 1996, p.18; and M.P. 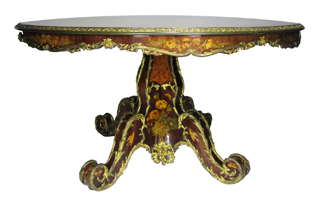 Levy, Furniture History Society Newsletter, no. 158, May 2005). 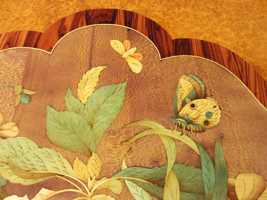 Martin Levy goes on to explore the connection between Baldock and the Blake family in E.H.Baldock and the Blake Family: Further Evidence, in Furniture History Society Newsletter No. 158, May 2005, p.1). The Connoisseur, August 1975, September 1975, ‘Edward Holmes Baldock’, Geoffrey de Bellaigue, Part I, pp. 290-299, Part II, pp. 18-25, p.19, figs. 3,4.